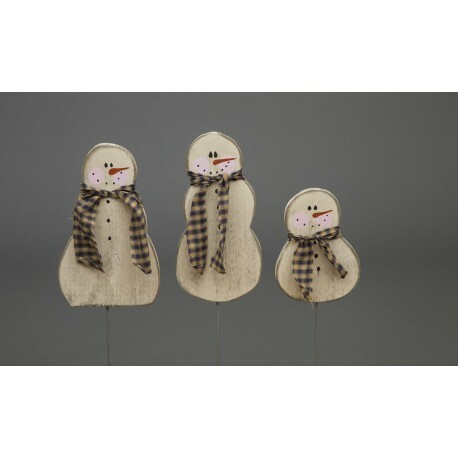 Add some primitive country charm to your home this holiday season with these handmade wooden, set of 3 Snowmen each on its own post. They work in the garden, near the entry way, or put them in a large Winter themed Christmas Vase at the door! Perfect for adding some personality to a large indoor or outdoor planter or in the yard. Add some rustic country charm to your home this holiday season with these beautiful handmade wooden, primitive snowman decorations. This set of 3 charming snowmen family will be a joyful addition to your lawn this holiday. This beautiful set of 3 rustic snowmen will look enchanting displayed on your front lawn on in your back yard all winter long.